these are boat docks, right? it's so weird seeing them empty.. nice shot! Fantastic composition! I love the shadows and the light. The symmetry of the docks leads you to the majestic mountain peeking out from the mist. Excellent! Took me a minute to figure out what this was:-) very cool. The empty, snow-covered docks look so lonely. You've really captured the mood here. 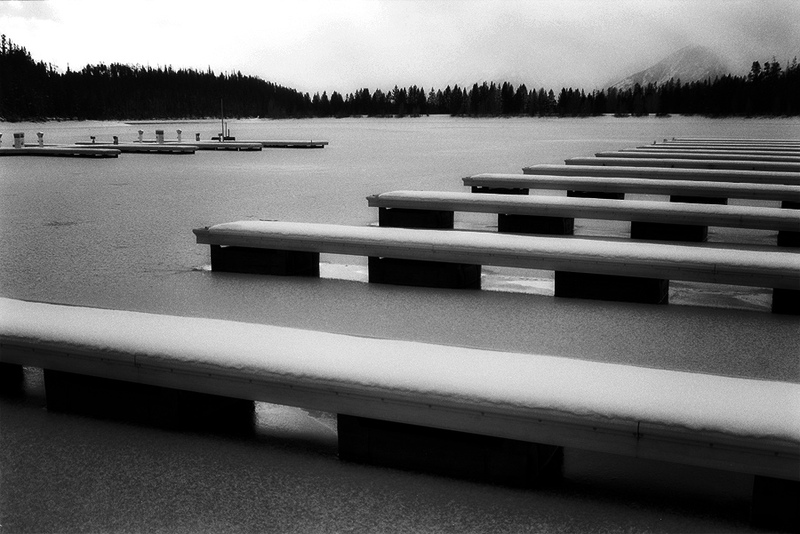 Love the repeating pattern of these empty boat docks, great B/W contrasts and tones. i love the pattern you approached here, very nicely done will! NIce patterns and repetitions. I need to go there in winter sometime. Really great composition ! The paralleled lines are nice controlled. What a gorgeous composition.The mountain, the snow & ice & the repetions. Yes I can feel the chill. Thanks for sharing this one. All the best & safe travels, Fritsch. Lines, lines, lines… all what I love! Great shot. It first impression I thought those were UBoats on the left side! WOW…that's such a beautifully composed image. there is a strangeness about this in the snow. very well done. Beautiful shot, love how practically everything is covered in snow/slush/frost. Nice work. Oh that does look cold. I like the slushy look of the water. Nice composition. That is a great composition. Well seen and executed. Interesting, lovely composed shot! I like it in bw. wonderful snow shot … magical! such beautiful texture here in the water and i love how the mountain fades into the mist and cold. Nice composition. This is a cold place, and desolate in this season.